Cost: Our tickets were comp'ed, but you can buy tickets here. They range from $13-$48. 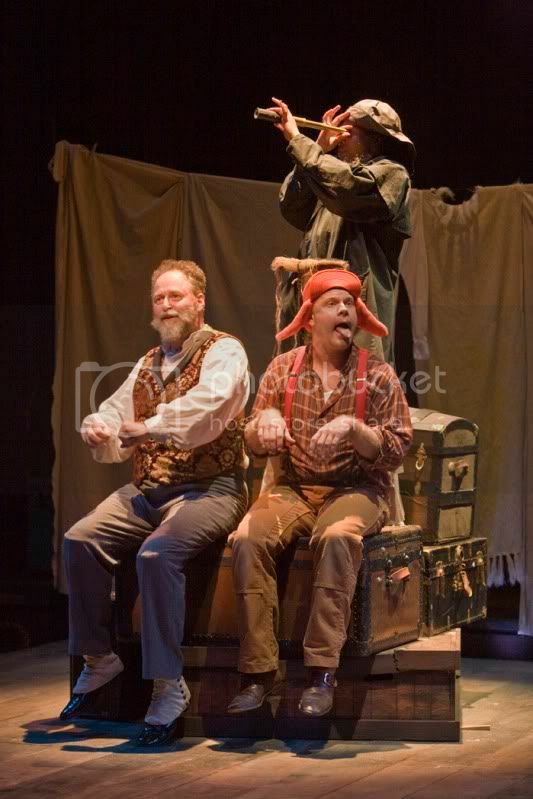 Dierk Torsek (Louis), Mike Ryan (Player 2), and Karen Aldridge (Player 1) in SSC's 2009 production of Shipwrecked! I really enjoyed this show! When we were seated, I noticed that there was minimal set, a rack of costumes, and a few instruments off in a corner. In a day and age where flashy costumes and ostentatious sets seem to be more important than the content of the show, I applaud the minimalism. (The minimalism says, to me, "This show stands on it's own. We don't need no stinkin' distractions.") It was roughly 1 hour, 45 minutes long with no intermission. The story itself begins as an adventure story, and then seamlessly shifts into a commentary on the fluid and delicate nature of memory. Andrew and I found ourselves captivated by the story, suspending disbelief (despite the absence of flashy costumes) and following along while Louis de Rougemont tells his fantastic tale. The story takes a dark turn towards the end, when he decides to publish his tale and is personally (and professionally) destroyed by the public scrutiny he is subject to as an author. (I think this is partly due to the fact that fiction was considered sinful, I think, at this point in history, but I can't find my notes from 18th century lit in college.) The audience experiences the same shock as the protagonist- how could his story NOT be true? We've seen the whole thing, from his perspective. What it really reminded me of was the episode of Buffy where she is in an asylum, and is made to question whether or not slaying vampires, etc, is all a delusion. We, the audience, had suspended disbelief through five and a half seasons, and accepted that - in the Whedonverse- all things supernatural were possible, and in one episode, WHAM! Reality hits like a ton of bricks. Vampires aren't real, and teenagers don't save the world. In a red-pill-versus-blue-pill moment, Buffy chooses the Whedonverse. In Shipwrecked!, Louis chooses to prove his story, and there is a moment at the end where he strives to prove that his experiences were real, while his reality cracks and his story rains down around him. Despite the slightly gloomy ending, it was a good show, and definitely worth seeing. Shipwrecked! led to a discussion about the fragile nature of memory- and how subjective it can be. (For example, take witnesses at a crime scene. No two people will have seen the same thing.) We talked about oral history, and the natural embellishment that can happen as one tells a story. So, I'd give it two thumbs up, because despite a less-than-cheerful ending, we still left the theater feeling good.